St John the Baptist was beheaded by the order of Herod, whose step-daughter Salome had asked for his head at the suggestion of her mother. Images of his head on a platter appear in Byzantine manuscript illumination from the 11th century, and the subject became popular throughout Europe largely through veneration of a famous relic at Amiens (brought from Byzantium in 1204). The type was known as a Johannesschüssel in Germany, and they were produced in wood from the 14th century, with production continuing in other media into the 16th century. The three holes in the underside of the neck indicate that this head may originally have been displayed on a platter, but that it would have sat semi-upright, rather than lying flat on its back. German examples with extant platters can be found with heads in a similar position. The carving which extends over the head except on the very back would also be unnecessary if the head had lain flat in a deep dish. The head has a hollow back reaching through to the mouth, with a rectangular opening, which is something of a mystery. There are other alabaster St John's heads with similarly hollow backs, as well as wooden examples. Various explanations have been suggested: that the hollows were intended to house relics, that they were to lighten the heads if they were intended to be carried around, or that they were to allow the insertion of objects to acquire curative properties (eg against headaches). There has been some debate over the origin of this particular example, which may originate from Germany or the Netherlands. It fits into a group of surviving heads which have numerous parallels with continental production. 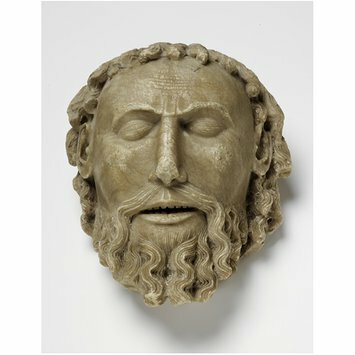 Carved head of St John the Baptist, with hair and beard made up of carved curls. There are substantial remains of mortar(?) in the hair and beard, particularly towards the back. The eye lids are carved (rather than left flat, for painting) with the eyes shown half-open, and the mouth is open, with carved teeth. The forehead is furrowed. No colour remains on the object. The head is carved carefully on all sides, except for the very back. On the reverse, the surface has been left flat, and there is a large rectangular opening which gives access to the inside of the head, which has been entirely carved out. Inside this cavity, the upper part has been darkened by soot from a candle which stood in the lower part. Remains of candle wax remain. The underside of the neck is totally flat (with the beard extending down in front), with three circular holes drilled. Substantial cracks run across the top of the head and down to the back to the opening. There is slight damage to the tip of the nose. Bought by Dr. W. L. Hildburgh in Paris in 1921, and given to the V&A in 1950. St John the Baptist was beheaded by the order of Herod, whose wife's daughter, Salome, had asked for his head. Images of his head on a platter appear in Byzantine manuscript illumination from the eleventh century, and the subject became popular throughout Europe largely through veneration of a famous relic at Amiens (brought from Byzantium in 1204). Heads were produced for personal devotional use, and were also used by guilds, many of which were dedicated to the saint. There may also have been a curative function involved, with particularly efficacy for head-aches. The cult was extremely popular - in the diocese of Norwich alone there were 120 guilds with St John as their patron in the Middle Ages. This example would probably originally have been attached to a platter, made either of alabaster, wood or metal - the type was known as a Johannesschüssel in Germany (see A.1-1919, a late fifteenth-century example in wood). They were produced in Germany from the fourteenth century (firstly carved in wood) and production continued into the sixteenth century. Generally they lay flat on the platters, but the three holes in the cut-off neck of this example suggest that it was perhaps intended to sit semi-upright. The carving, which extends over the head except for on the very back, would also be unnecessary were the head intended to lie totally flat in a deep dish. Other German examples can be found with heads in a similar position (eg Arndt and Kroos 1969, p.280 (Göttingen Städt. Museum)). The reason for the hollow in the back of the head is something of a mystery. 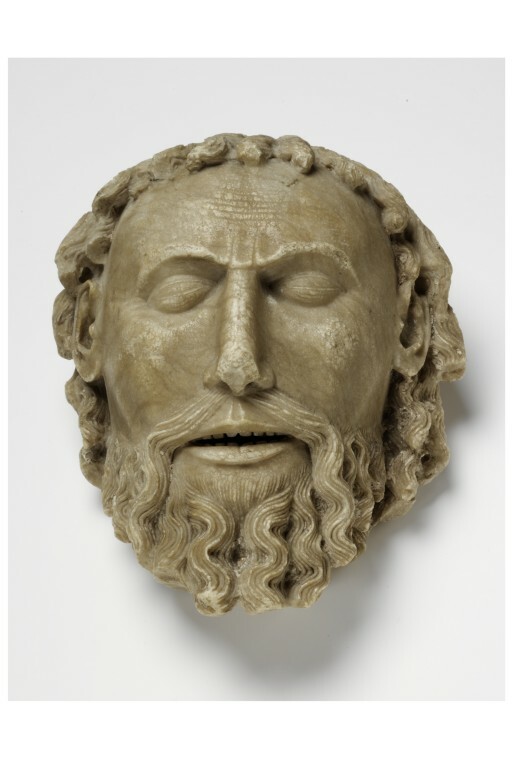 There are other alabaster St John's heads, which are also hollowed out to the mouth, with access from the back., as well as wood (eg Hildyard 1937, p.422 (Bavarian National Museum); Arens 1997, pp.114-6 (Mainz Landesmuseum). Various explanations have been mooted: that the hollows were intended to house relics, that they were to lighten the heads if they were to be carried around, or that they were to allow the insertion of objects to acquire curative properties (eg against headaches). The subject was also popular with the English albaster industry, although these images tended to show the head in semi-relief at the centre of a rectangular plaque of alabaster, rather than being carved in the round like this example. The attribution of this example is uncertain, but it is thought that it might be German and could date from the later fifteenth century. Although it is agreed that this alabaster carving is not English, there is some debate as to its most likely origin, with Cheetham suggesting North Germany. The head is quite different in style from most English alabaster examples of the subject. 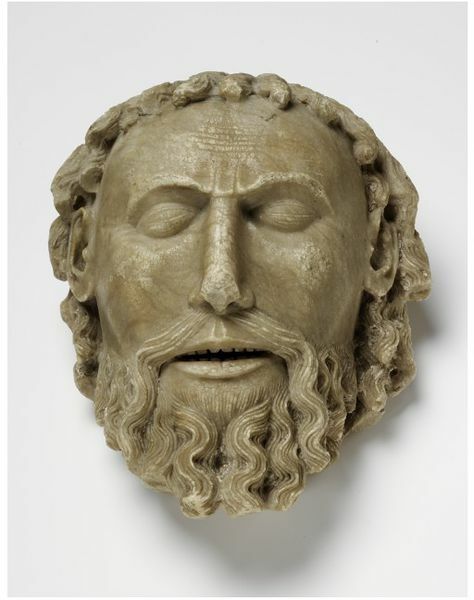 Though there are two similar heads thought to originate in England (A.79-1946, and an example in the Ashmolean Museum, Oxford), they are not closely comparable. Another group (listed in Williamson 1988), into which this example fits far more convincingly, has numerous parallels with continental alabasters, particularly those from the Netherlands and Germany. Hildburgh 1937 attributed the group to Germany, perhaps Westphalia. Arens 1997 attributes both the Mainz head, and the V&A example to either Westphalia or the Netherlands, and dates the V&A head to c. 1430-50, following Williamson 1988.